An especially lucky WinADay Casino player has hit a record-breaking $329,861 jackpot on the unique casino's popular Vegas Vibes slot game. The big winner was James H, a ski technician who plays mobile casino games on his smartphone. James and his girlfriend plan to take a dream vacation in the Alps to do some serious skiing. "Wow! Every jackpot win seems to break a record lately!" said WinADay’s casino manager, Michael Hilary. "We're so glad James had placed a max bet when he hit those five Elvis symbols." "I've had some big wins, but they tell me this beats the casino's record," James told a customer service rep at WinADay. "That's kind of insane!" To celebrate James' windfall, WinADay made Vegas Vibes its Game of the Month for February. You can get 60% added to your deposit to get extra play time, and playing Vegas Vibes earns tickets in a Cash Draw at the end of the month. "We want to go to Europe for the first time and ski in the alps," said the winner. "We've been saving for that for awhile. I'm also thinking of getting a motorcycle but not sure yet!" "I play on my phone lots, not usually high bets. But I got over $400 on free spins this time so put up my bet to max. That's when I hit the jackpot!" he said. "Winaday's slots are easy to play on my phone. Vegas Vibes is definitely my new favourite!" WinADay Casino has been entertaining players all over the world with innovative slots and video poker games for more than ten years. The popular online casino's options for quick and easy deposits and withdrawals now include cryptocurrency (Bitcoin, Bitcoin Cash or Litecoin). When asked if he had advice for other players, James said “One day will be your lucky day. You might think it won't ever happen to you but really you never know. Someone has to win it!" 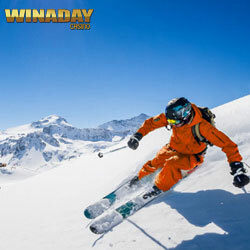 Every max bet contributes to WinADay's site-wide progressive jackpot pool. It can be won playing many of the casino's premium slots and is usually hit before it reaches $300,000. The previous record was the $277,482 jackpot Joe P won playing the Pyramid Plunder slot.